THE NUMBER OF large donations made to TDs, senators and MEPs has plummeted, with €6,360 received by public representatives in 2017 compared to €72,969 in 2016 and €33,870 in 2015. There was a general election in 2016, which would have led to more TDs to seek donations. However, the 2017 figure is also significantly lower than in 2015, even though the number of public representatives eligible to receive such donations in 2017 compared to 2015 increased significantly – from 166 in 2015 to 229 in 2017. Over this period, there has been no change in the legislation that controls what kinds of donations have to be registered. The new figures released today by the Standards in Public Office Commission do not include smaller donations of under €600. Anyone who serves as a TD, senator or member of the European Parliament is required to present a statement of all donations over €600 received in a year to SIPO by 31 January of the following year. 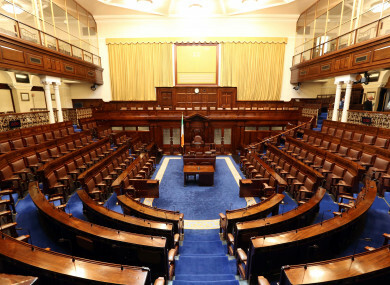 Only seven public representatives reported donations over €600 last year. Four of these donations went to Fianna Fáil, with party leader Micheál Martin receiving €1,000 from the party. Michael McGrath, his finance spokesperson, received €1,000 from the Cork South Central branch. TDs Darragh O’Brien and James Lawless received €805 and €800 respectively from members of the public. Fine Gael’s Kate O’Connell received €760, Labour’s Alan Kelly received €995 and Sinn Féin senator Pádraig Mac Lochlainn received €1,000. The Labour Party received an additional €1,490 in donations, while the Social Democrats received a total of €1,760 in donations to a number of its candidates and branches. These donation statements were presented to each house of the Oireachtas today. If a a TD, senator or MEP fails to present their statement of donations by the deadline, they may have to pay a fine of up to €2,500 and to an on-going fine of up to €500 for every day until they present their statement. All are required to complete these statements, though they may state that they have not received any donations of over €600. While 14 public representatives did not meet the deadline this year, all cases have been resolved and no one was reported to the gardaí for failing to disclose their donations on time. TDs, senators and MEPs are not allowed to accept anonymous donations of over €100. They cannot accept a donation over €200 from a corporation in a calendar year, unless the corporation is registered with SIPO. The maximum that one individual can receive from any one donor or corporate donor is €1,000. A donor is only able to give up to €1,500 to multiple members of the same party. If the donation is above the limit, the public representative must return the amount that exceeds the limit to SIPO within 14 days of receipt. Sometimes the donors themselves are required to make a declaration to SIPO – if they donate more than €1,500 total to two members of the same political party or if they donate that amount to a political party and at least one member of that party. Just two donors made this declaration for last year, with a total value of €4,245. The full list of donations can be viewed here. Email “The number of large donations made to politicians fell dramatically last year”. Feedback on “The number of large donations made to politicians fell dramatically last year”.